ATM2- WT wall mount model with the Scapulo-Thoracic Stabilization (STS) Harness compliments the ATM2 device by addressing common musculoskeletal disorders at specific upper-body areas. The STS Harness was developed specifically to target, isolate and stabilize those difficult areas of the upper thoracic, shoulder and cervical regions. The Harness provides more consistent isolation properties, leading to even faster and better results. Easy Installation (16″ on center install template includes), Space Saver, and Height Adjustable. By Combining joint repositioning (similar to the Mulligan Concept), with compression (similar to the ASLR test), almost all movement impairments can be normalized within seconds. The restoration of normal movement is an indicator that the CNS has completely transitioned from a pathological muscle activation pattern to a normal muscle activation pattern. Combining active movements in the neutral range, in a functional, weight bearing position, against an isometric resistance, causes the CNS to memorize the normal muscle activation pattern. Almost all patients will feel an immediate, significant and long-lasting reduction, if not elimination of pain for back, neck, pelvis, shoulder, hip, and knee movement impairments. 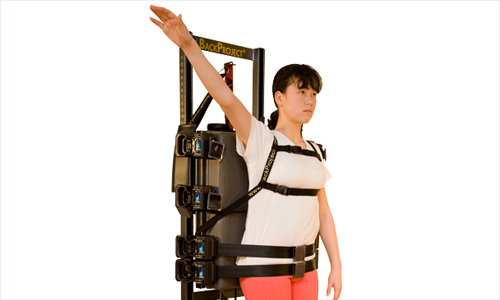 By having the patient in a full weight-bearing position and using the stabilization belts, the ATM2 can reposition and stabilize many different body areas so that specific movements that are painful will immediately become pain-free. According to the ATM® (Active Therapeutic Movements) theory, when painful movements become pain-free by using the ATM stabilization belts, the CNS immediately transitions back to a normal muscle activation strategy. Now that the impaired movement is pain-free, the patient does 10 movements towards what was previously painful, but now pain-free, during which time the CNS memorizes the correct muscle activation pattern. After releasing the patient, expect immediate, and long-lasting results. You now have an established method, the ATM Concept, for taking your practice to the next level, immediately! My partner and I own and operate a Chiropractic and Rehabilitation clinic in Latrobe, Pa. We were introduced to the ATM2 approximately 7 months ago and purchased a unit. As Chiropractors the majority of the patients we treat have recurrent chronic problems. While we have enjoyed good success in helping patients resolve their problems there is a high percentage who continue to present with the same condition over and over. The key to stabilizing these patient is correcting the muscle dysfunction and abnormal movement patterns that have developed in conjunction with their pain syndrome. Prior to the use of the ATM2, this meant spending a significant amount of time training the patient to perform exercises designed to correct this dysfunction, and even more time for the patient to try and do the exercises correctly. Even if they could follow through with the exercises correctly the results were often disappointing. The ATM2 has proven to be an invaluable tool to address these conditions. Explaining the concept of why it works to a patient is somewhat difficult, but getting them to understand the results is not. When they step off the ATM with less pain and improve motion they know they are on the right track to recovery. One example of the power of this type of therapy involved the treatment of a 21 year old female. This patient was seeking treatment for chronic lower back pain that was the result of being in a MVA 14 months earlier. Despite being on multiple medications and undergoing 18 sessions of physical therapy she continued to suffer from debilitating pain. Within 2 weeks of combined treatment with the ATM and manipulative therapy her pain had reduced to a mild tolerable level. But the best part of her story has to do with her right shoulder. The accident had resulted in trauma to the shoulder that required surgical repair. When I initial seen her she was in her 8th week of post surgical therapy. At this point she had less than 90 degrees of active abduction and flexion of the shoulder and the treating therapist was telling her that she would probable have to live with the pain and dysfunction. With her consent we decided to try and treat the shoulder on the ATM2. With two treatment she was able to achieve full ROM of the shoulder with only mild discomfort. Use of the ATM2 in our office has increased the efficiency of treating many types of musculo-skeletal problems, and it consistently provides me with the ability to help patients that have failed with other types of treatment.